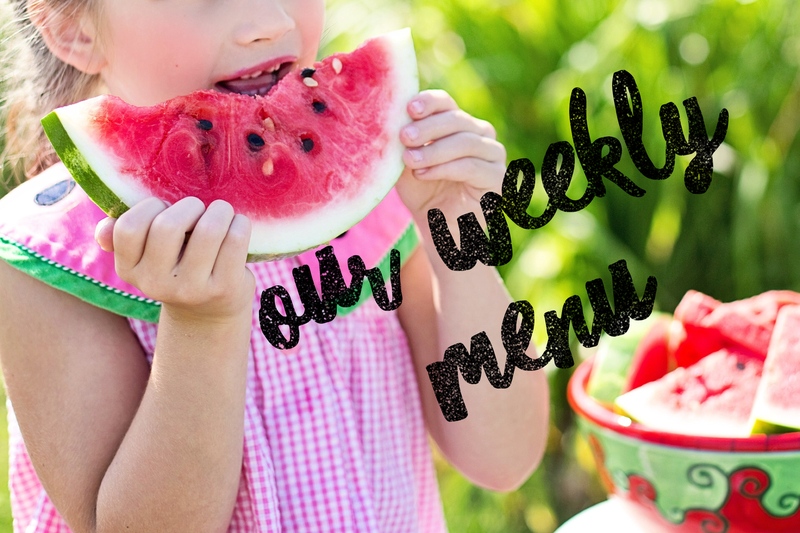 Our weekly menu is ready for our first week of summer vacation!! After a particularly busy weekend of traveling, we are ready for some delicious southern comfort food. In addition, I have a few extra dessert items posted. My babies will be in the kitchen helping me bake some extra treats to have on hand. 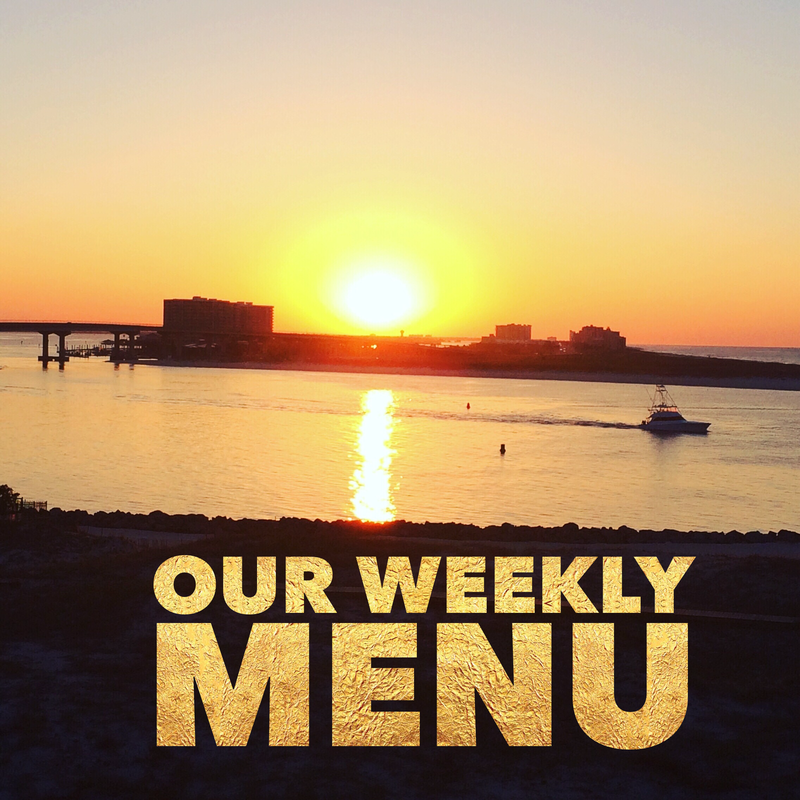 For our full menu, Click Here. Click here for more information on and about Trim Healthy Mama. 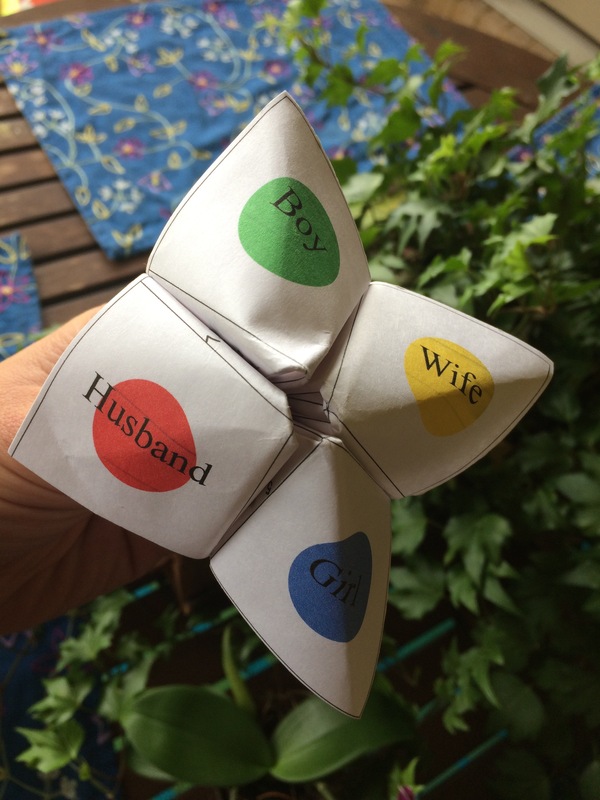 A few weeks ago my oldest daughter came home with a blast from the past in the form of a “Story Teller” otherwise know as a “Cootie Catcher”. How on earth it got that name, I have no idea, however it sure sent me back a few years. She was especially shocked when she saw me demonstrate my “fortune teller” skills. Not only did she request that we create a special one for her, which had me exploring the internet for a printable pattern, but it also gave me the idea for my Date Night version. A couple of winters ago I came across a creative Christmas gift for my sister and brother-in-law, A Year of Dates. With creative, inexpensive and easy ideas, my husband and I challenged them to a date night a month. Since then my family and I have designed and created our own date night books as wedding and Christmas gifts. 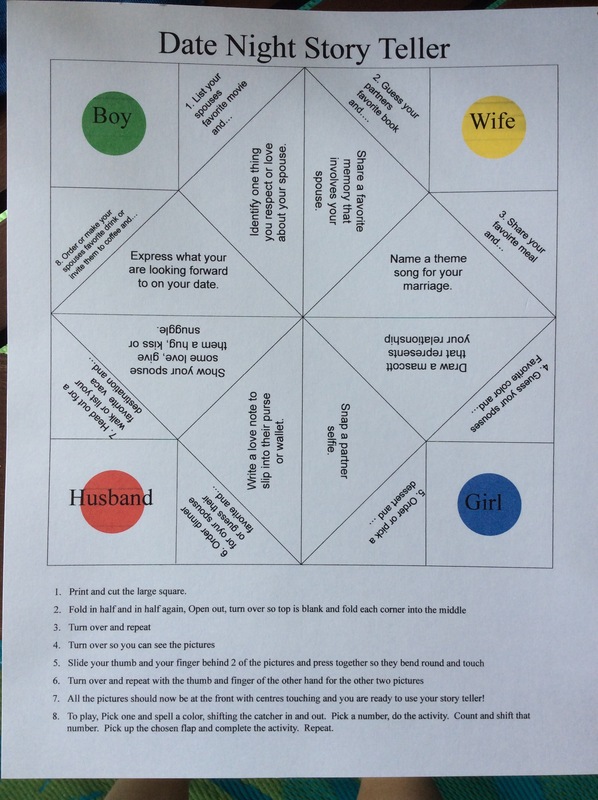 Always looking for fun ideas to add to our date night collection, I recently created this Date Night Story Teller using the template from Downloadable Cootie Catchers. Head out to Dinner or plan a Stay-Date at Home. Is your spouse long-distance or deployed, this date can be played over video chat. Print, fold then pull out this “Blast from the Past” Date Night Story Teller and encourage your partner to play along to spark a creative conversation. To play ask your partner or spouse to pick a color. Spell that color or word moving the teller back and forth. Want more of our unique and fun date nights? Over the next few months, I’ll post a new and creative date night that I challenge you to try! Hard to believe it’s the last week of school and almost vacation. With a summer full of interesting plans and new adventures, our family is excited to for this season to start. As we gear up for our final week before the summer break, our meals are easy and quick to compliment our busy lives. As always, we follow the Trim Healthy Mama plan keeping us healthy and full of energy. Wanting to learn more about this lifestyle, check out the Trim Healthy Mama Website, Book or numerous facebook pages for more information. For our full menu, click here. Monday: Armadillo Eggs (S) from Home Sick Texan One of our family favorites with a little different recipe. We didn’t get a chance to make this yummy meal on Saturday so I put it back on the menu for the start of the week. Tuesday: Luau Ham (S) from Love Foodies I am going make a few changes to this recipe to keep it within a S setting and THM. No carrots for me, they have too many carbs so I’ll omit them from my meal but may make them for my husband and kids. I’ll use coconut oil instead of canola oil and in place of the pineapple juice I will use a jar of flavored Bai. Finally, I will replace the brown sugar with xylitol and molasses. Wednesday: InstaPot Chicken Tortilla-less Soup from 40 Aprons. This recipe sounds and looks amazing! I can’t wait to try it this week. Thursday: Nachos with Blue Chips (E). Made with yummy beans and low carb cheese this is a crowd favorite for our little family. Friday: Low Carb Pizza (S). We are starting off the weekend and summer right with a pizza and movie night! Happy Mother’s Day to all the Mamas! We hope your day is filled with love and fun with your family. We are celebrating by headed out to a local dinner (and maybe a trip to the beach). Thank you to my husband and our three babies for the the orchid in the above picture. I so love flowers and these remind me of Hawaii! 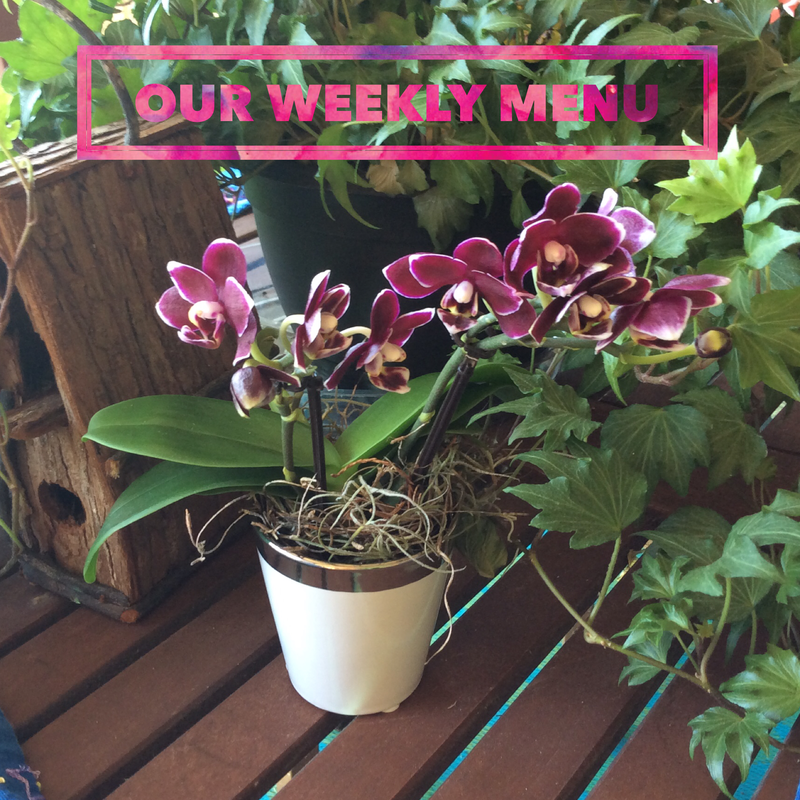 Our menu is ready for this their week in May. With this busy time of schools wrapping up their end of the year activities, our Menu Choices are quick, easy and kid friendly. Friday: with THM Crescent Rolls Low Carb Sausage and Cream Cheese Crescents from My Fling with Food (S) as the pizza crust. The quest for the perfect Trim Healthy Mama pizza crust continues. Saturday: Armadillo Eggs (S) from Home Sick Texan One of our family favorites with a little different recipes this time. Happy Sunday! 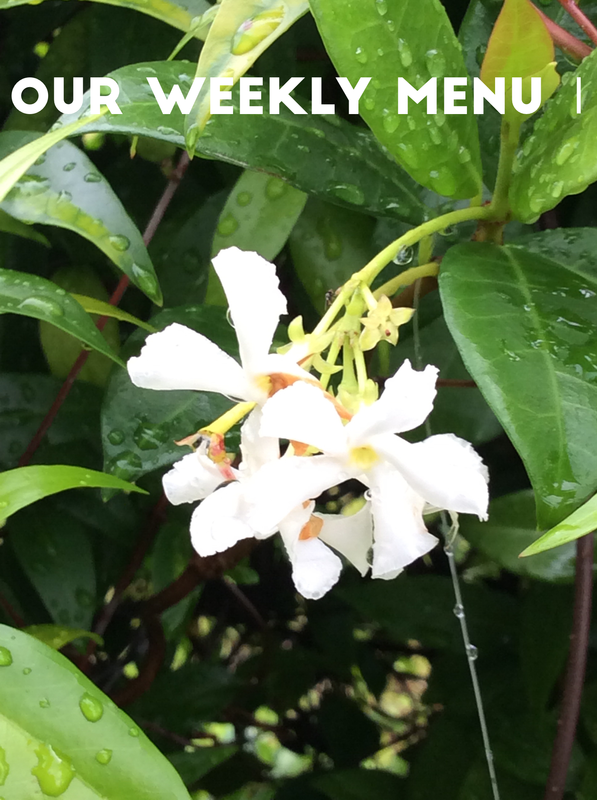 Our Menu is ready for this week after an amazing and educational mini family vacation. A special shout-out and sincere thank you to the Special Forces Charitable Trust for a most memorable family retreat. We were blessed to hear from a variety of experts on topics that helped us grow in both our professional and family lives. Thank you to the following speakers for your expertise and entertaining visits. Travis Wong – Our girls were excited to hear and practice moves from this Parkour expert. Now we are ready to start our week with fresh, new insights and a healthy menu! Monday: General Tso’s InstaPot Shredded Chicken (S) In order to blend into our Trim Healthy Lifestyle, I will substitute glucosamine for the thickener and use Braggs Liquid Amino Acids for the soy sauce. I’ll also replace the sugar with xylitol. 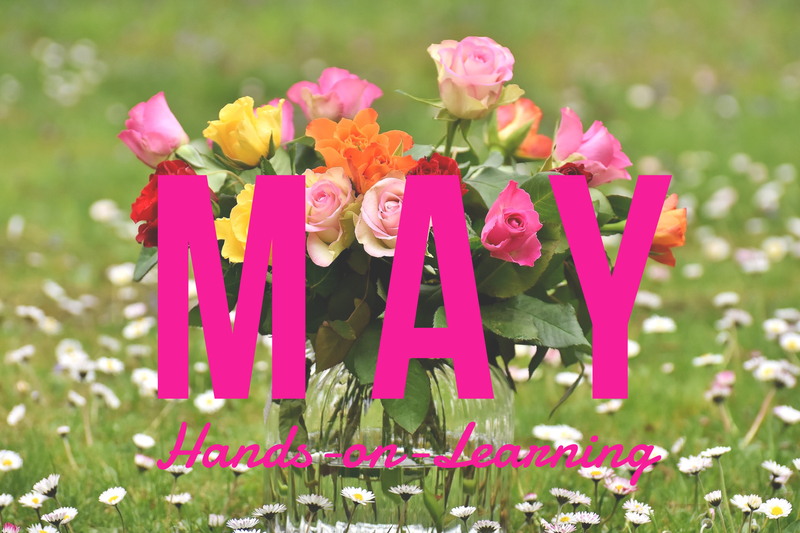 Looking for creative ways to practice spelling and making words this month? Check out these quick and easy projects. A friend of mine tagged me on this interactive learning post from Planning Playtime. I loved the creativity of this project and I decided to give it a try. 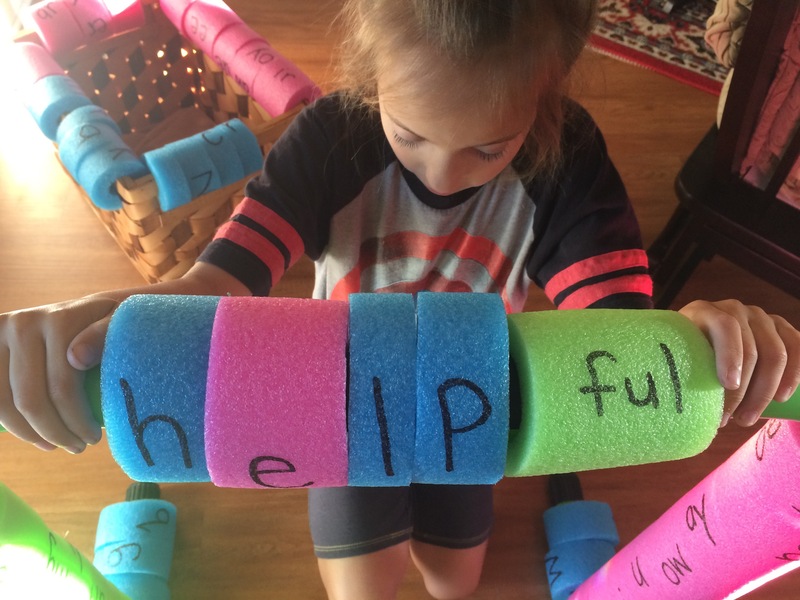 This craft was sure easy to adapt to my preschool, kindergarten and 2nd grade learners. 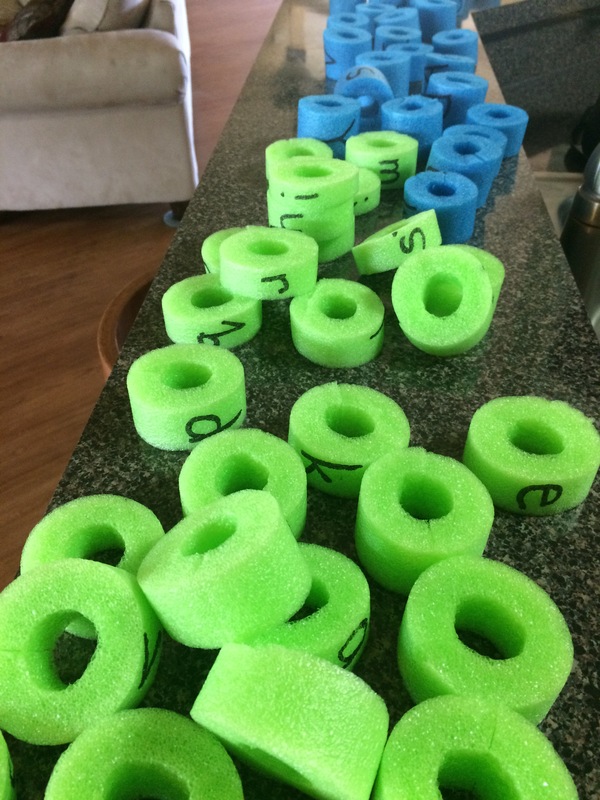 For my oldest, who is working with common word endings, I wrote her suffixes on a green pool noodle, vowels on pink and consonants on blue. She then used my equalizer sports bars to organize and spell her words. My middle girl, spelled words with blue (consonants) and pink (vowels) noodles and our youngest matched uppercase with lowercase letters. Use larger noodles; smaller ones tend to tear easy. For ease of cutting noodles, use a serrated bread knife. Only keep the letters out needed for your lesson. To many letters were scattered about and my kids struggled to stay on task. Another project I created was using large Duplex Legos to form words. My oldest matched root words to suffixes. Additionally these legos could be used for CVC or larger word blends. Another matching activity, that my oldest loved, was pinning the suffix on the root word. 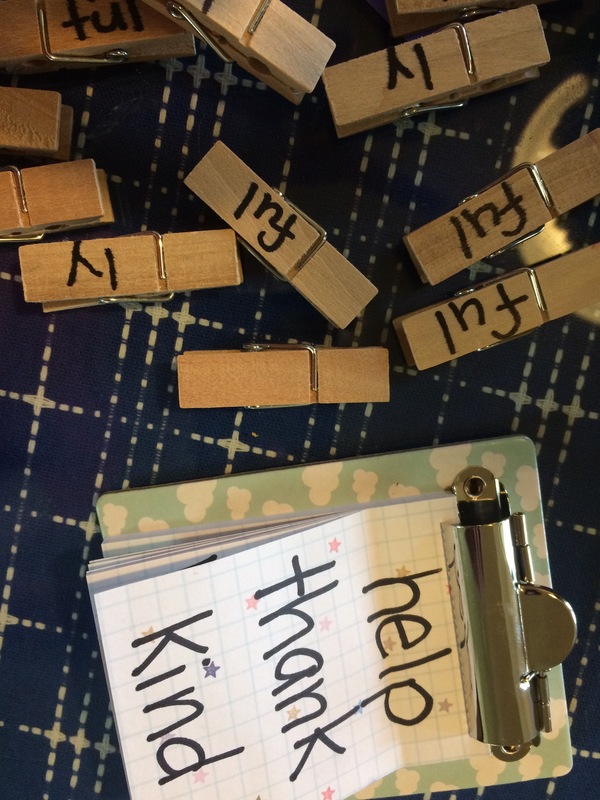 Use masking tape to write letters onto clothespins so they can be reused. Use cardstock or notecards, something with a bit more weight, to write the words. This will help the clothespins hold.